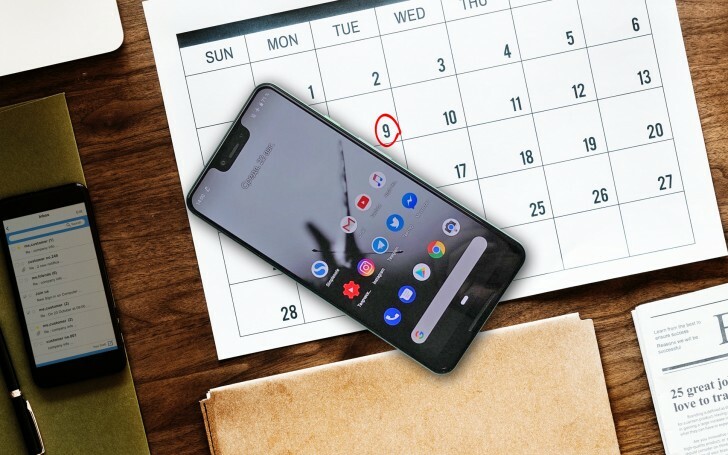 Google Pixel 3, Pixel 3 XL Phones May Launch on October 9 - Playfuldroid! The Google Pixel 2 and Pixel 2 XL phones were made official on Oct. 4. Hence, the rumor mill has been speculating that the upcoming Pixel 3 and Pixel 3 XL smartphones will be made official on Oct. 4. However, a fresh report on Bloomberg has revealed that Pixel 3 and 3 XL phones will go official on Oct. 9 through a launch event in New York. Plenty of leaks have revealed almost everything about the Pixel 3 XL smartphone. Hence, it does not seem sound right as to why may Google may want to delay the arrival of Pixel 3 XL series by 5 days. It is speculated that Pixel phone launch event will be also used o announce some other smartphones such as Pixelbook and Pixel Watch. Google is yet to confirm the launch date for announcing its new Pixel devices. The Pixel 3 is expected to feature a 6-inch 18:9 FHD+ screen. On the other side, the Pixel 3 XL is expected to arrive with a 6.7-inch 19:9 FHD+ screen. Both phones could be powered by Snapdragon 845 SoC and 4 GB of RAM. Both phones may feature 12-megapixel rear camera and a pair of 8-megapixel selfie snappers. The Pixel 3 and Pixel 3 XL could be the first devices to arrive preloaded with Android 9 Pie.